simply yin: A blog award! Some replies, and more inspiration! 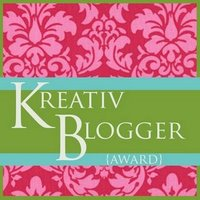 A blog award! Some replies, and more inspiration! Yesterday Ryan had his chance to dress up when he went to a friend's fancy dress birthday party. Guess what was the only character he was willing to go as? 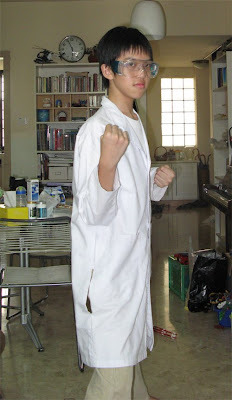 A scientist! 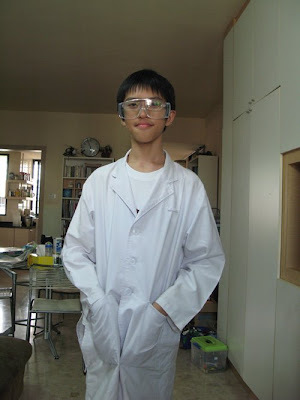 DH borrowed a lab coat and goggles for him, and he was voted best dressed by his friends. Amazing! And he was so happy that he won a prize of a Risk Game set, his favourite board game. He looks so big in these photos! Can you believe he'll only turn twelve next January? My baby is all grown up!! The award calls for a list of 7 things I love or am thankful for, that's easy! 1. I'm so thankful for my Lord and God who has rescued me and blessed me beyond words can describe. Thank you Lord. 2. Very thankful for my husband of (nearly) 15 years, who is also my friend of 27 years! Although we did nothing much to deserve it, God has blessed us with an incredible marriage. His words to me for my last birthday were, 'grow old with me, the best is yet to be'. 3. I love my children of course, although they give me equal amounts of joy and stress, what would I be without being their mom? The best job there is, for me at least. 4. I'm thankful for my part time job, I'm facing risk of layoffs in this climate, but still, to have had this part time position for the last five years has been so great for the social/financial front and the home front. 6. My collection of rings, mostly costume, semi-precious, vintage flea market finds, but all huge! 7. My digiscrapping hobby, my creative outlet, recording memories, my blog, my store, and ALL of YOU!! Wow Ryan sure is tall, he looks all grown up. 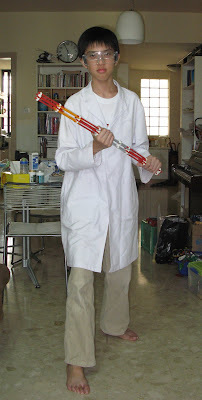 How fun that he wanted to dress up as a scientist. So, I visit the Digitreats (Pam) blog (http://digitreats.typepad.com/)daily and she had some digi scrap books printed by Artscow and raved about them. She had 2 books printed so far I believe. They are 8x8. You c an even get free prints just for signing up. 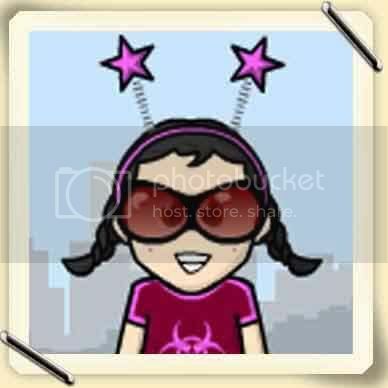 Check out her blog or go to Artscow directly at, http://www.artscow.com/. I'd love a blinkie too. I've only been scrapping for 2 weeks, and I LOVE your templates. Your LO's are absolutely inspiring. Here are some pages I've made using them. I think 'friends of Yin' sounds great for the blinkie..I can't wait to be one of the first 'Yin blinkie' owners!! Thank you so much for your kind words about my LO, and thanks for showing it on your blog! I love your layouts! they are so easy to use and create with. I discovered your site a while back and I have been creating every since. Congrats Yin on the blog award. Looks like you are doing well this month. I just saw your "Snow in central park" layout in Creating Keepsakes Dec 08 issue. Congrats. Love your templates as always.